On this week's Chicken Thistle Farm's podcast, Kelli and Andy spoke of their second year of farrowing which had me thinking about farming disappointment. I am not talking about the "don't count your chickens before they're hatched" failures, which happen early on in a rural life. I am talking about disappointing results in spite of the careful implementation of sound farming practices. 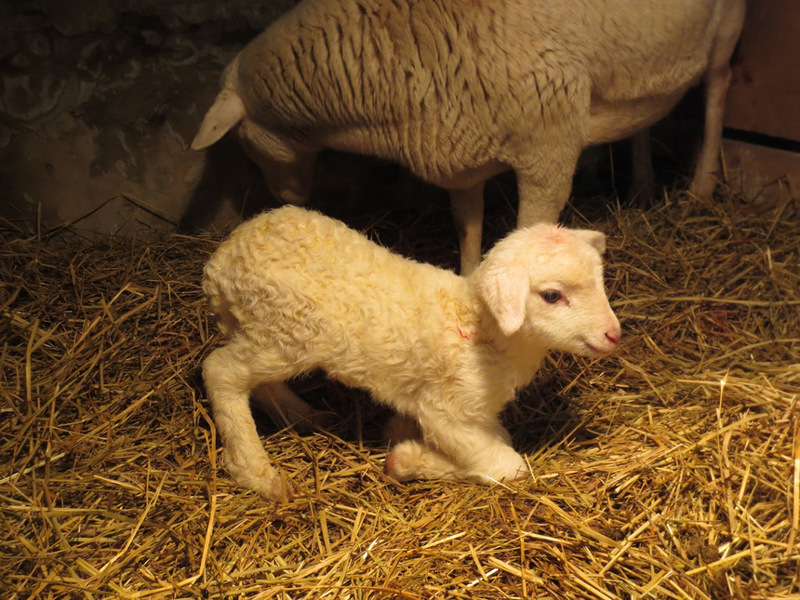 On Wednesday I culled #003, born here at Lilac Hill from my friendliest ewe. On paper, she had hardy parents, a gentle nature and respected our strands of electric twine fencing through the summer grazing season. In reality she always looked lousy: her coat was often dirty, her nose was crusty (the other sheep did not have these probems), and she did not breed this year. (Her twin sister did not breed either but, I decided, because of her genetics, temperment and health that she has another breeding season to prove herself.) My study of sheep health, careful feeding, acquisition of quality parent stock and daily observation did not prevent this unthrifty ewe. With my farm goals in mind, I decided "it was time to put on my big farmer boots," and she was culled. Hopefully as we continue on Lilac Hill I will develop the widsom of a veteran shepherd and the the disappointments will not be felt as sharply. On the weekend I moved the ramling and 005 back with the flock. Like her flockmates, 005 keeps her lamb near her side by calling to him with those deep "new mama" grunts . When he wanders a bit too far she noses him into place by her side. 005 sought the barnyard stall, pawed a nest in the straw and lambed this morning.She avidly licked her ram lamb dry and he was soon noisily nursing. Four of our Katahdins have not lambed. These four sheep are "theaves"( Theave or theaf (plural of either: theaves) – a young female sheep, usually before her first lamb (used especially in lowlandEngland). Also gimmer. ), first timers.These two girls, 005 and 006 are showing signs that they are nearing the end of their pregancies. In addition to physical changes, their behavior has changed and their usual reserve has been replaced with friendliness.Verbena and her sister Viola do not show the physical changes associated with late pregnancy. I pulled Burgess from the ewes in January so they could lambs as late as June, if they are bred. So, my shepherd's mind is whirling. If they did breed, why so late? If they are not bred, why not? 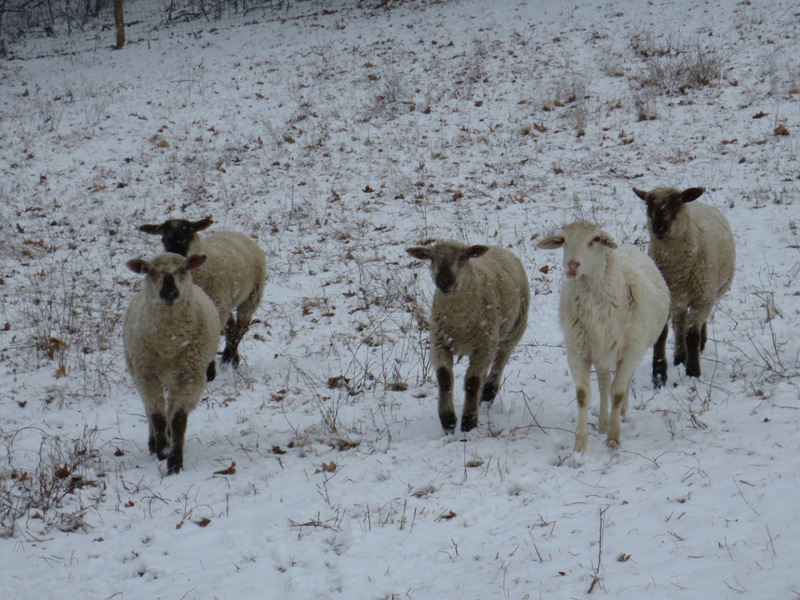 They could have been a bit young when l put Burgess in with the ewes so perhaps, if bred, their lambing date is more in tune with their age.These girls are from Mab, one of my first and favorite ewes. She is not skittish, has a large, deep body, and has lambed every year without trouble; I want her genetics in my flock. Do I give them another year or do I cull? With her dark coat,it is easy to see that Mauve is starting to shed. Undeterred by Puxsutawney Phil's predictions for an early spring, snow has been falling all morning. In spite of its inconvenience, I do perfer this light snow to last year's unseasonablely early spring. 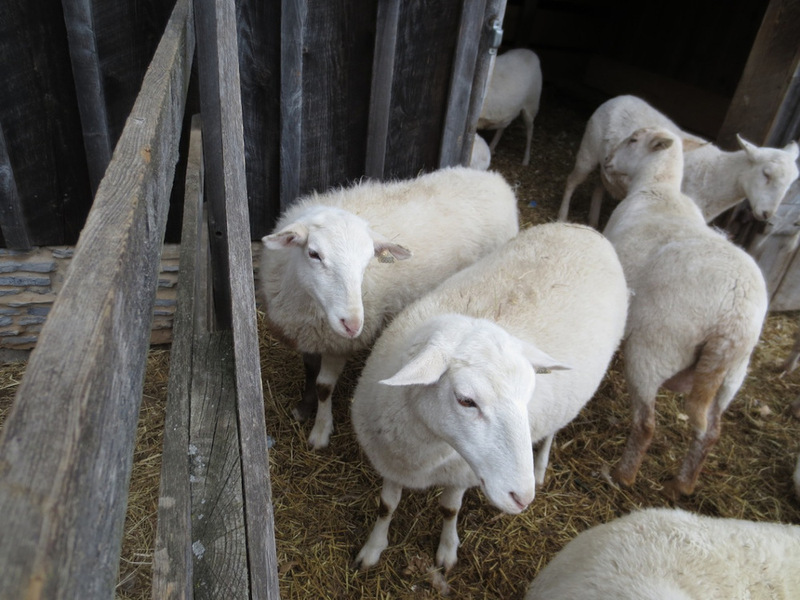 With the wethers and ram out of the barn and across the road, I move the ewes and lambs into the barnyard daily. 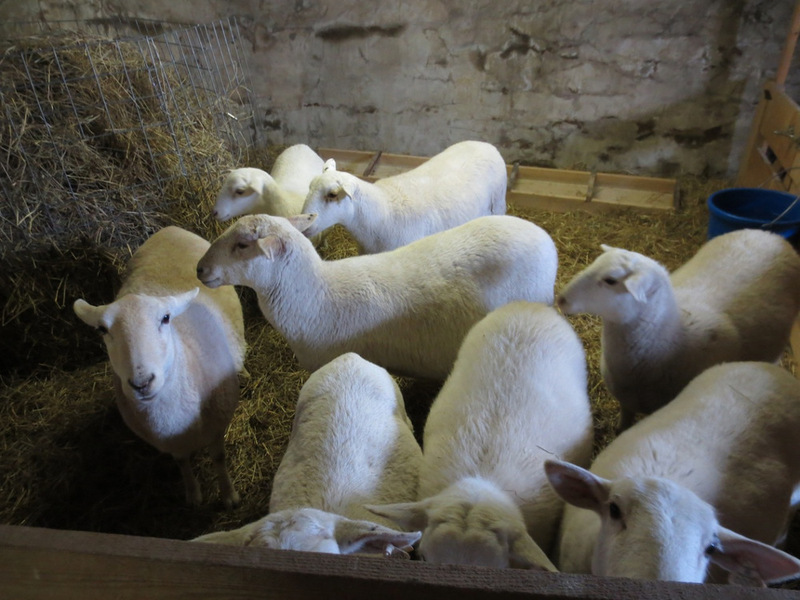 Within the confines of the barn, the lambs learn to move with the flock from the ewes' pen, through the temporary corridor, to the barnyard stall and then the barnyard. The first moves were loud, with ewes calling to their lambs as they made the trip to the outside. After a few days of practice the flock moves as a whole, lambs jostling along as a group and rubbing against their mothers once they reach the barnyard. For our rotational grazing during the green seasons, a flock that moves well together is an asset. 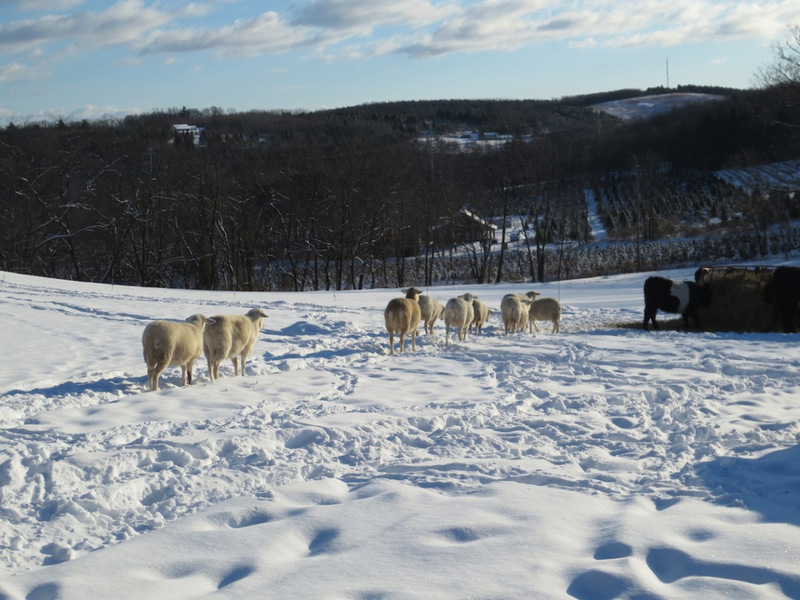 This mild, windless day seemd a perfect time to intorduce the lambs to snow. With a forkful of hay and a scoop of grain we we able to lead the boys to the field across the road. Moving the boys to the secure field frees up the stall open to the barnyard. Initially the boys had twice daily wheelbarrow hay deliveries. 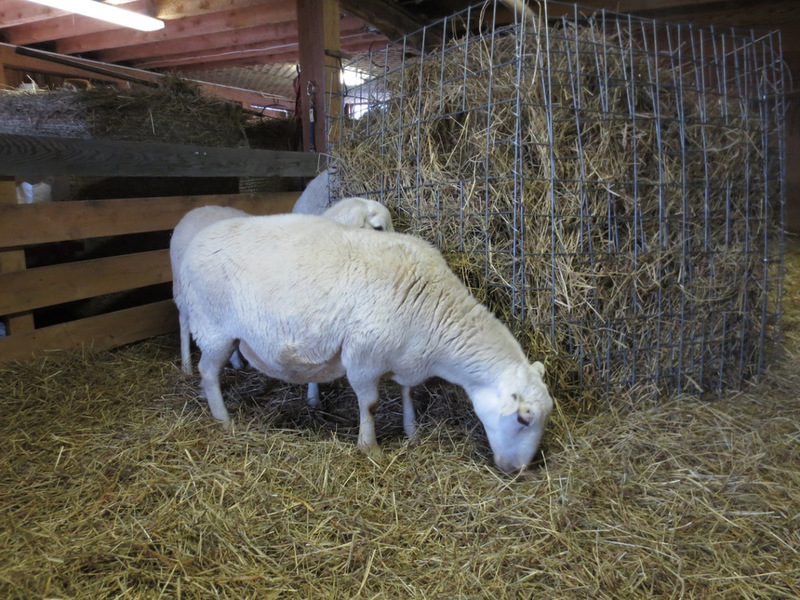 Now they have the round bale feeder from the ewe's pen.They do love to nose around the farthest reaches of the pen. This morning's peek over the ewe pen gate revealed Maude with pair of white, curly lambs. By the time they were discovered, they were almost dry and full bellied.Portia and Paxton weighed in at 7.5 pounds each. I am especially relieved to see that Maude's lambs are strong and well formed;last year's twins were weak and died early.Mauve and dappled Hugh left the lambing jug to make room for the new family. Hugh's intoduction to the flock was accompanied by Mauve's nickers and protection. 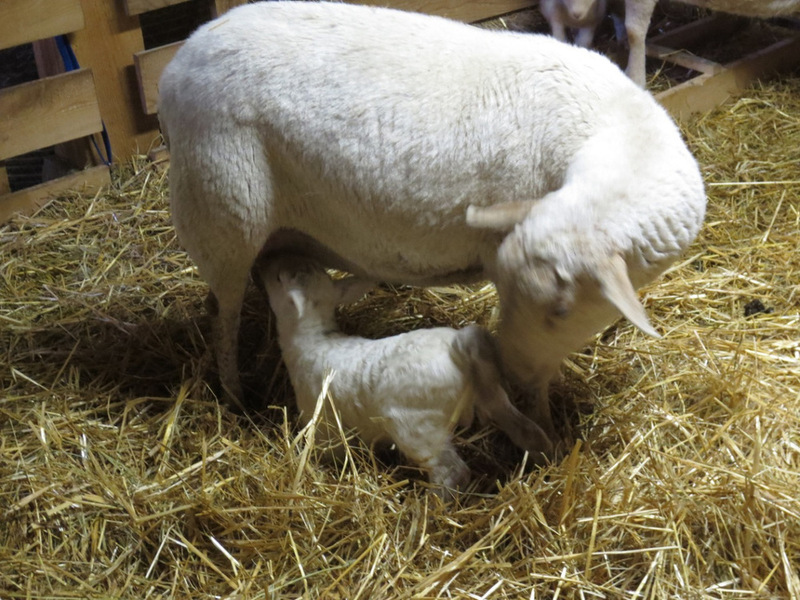 After a night of dreaming of lambs I found Mauve in the ewe pen with her own spotted ram lamb before dawn. He was already cleaned off and she was nickering to all 8 pounds of him. Mauve is from the first batch of ewes we bought from Dave Hartman. In spite of losing her lamb last year, Mauve knows how to care for her lamb. Mauve is my wildest ewe.Hopefully I can calm her by handling her lamb while they spend time time in the lambing jug. 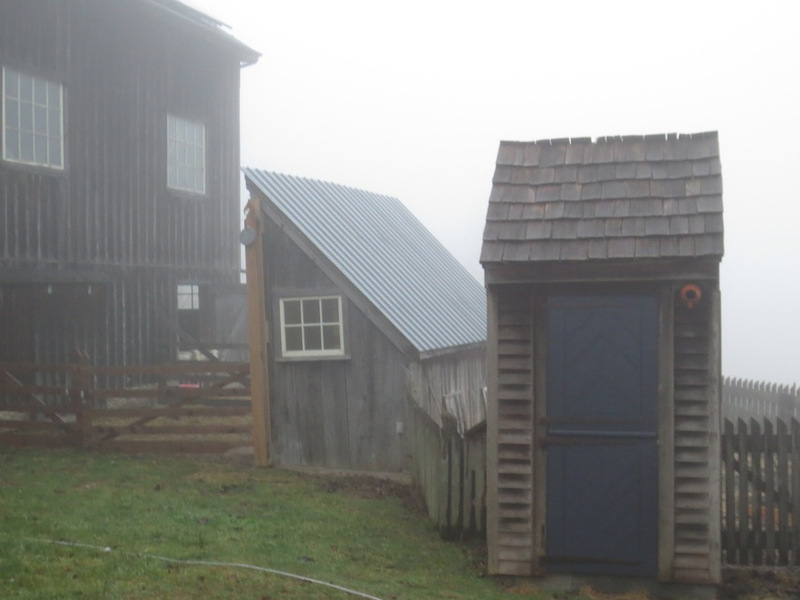 Lilac Hill farm in late winter is all about food, water, shelter and waiting. 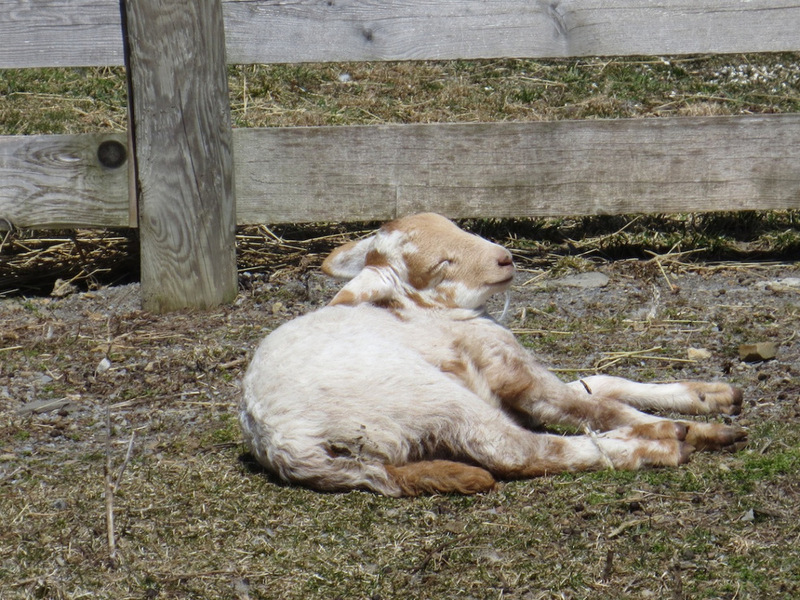 Waiting for kids and lambs, waiting for nest making and eggs, and waiting for the first bits of green in the pastures. Already the days have lengthened and evening chores are not completed in the dark. In spite a false alarm when I was away from the farm for 6 days, Gretel waited to kid until the week after my return.On Sunday the 24th Gretel kidded. Ernest (6#) and Cecily (8#) arrived without complications. Unfortunately Gretel's colostrum was too thick for them to nurse so we thinned the milked colustrum and bottle fed it to the Wilde kids (my daughters' name choices were inspired by Ocsar Wilde's "The Importance of Being Ernest") in front of a warming fire. The kids spent the first night in the house then were returned to the barn. All this intervention was guided by our friend, Mike, with years of goat experience and who just happened to come to dinner on Sunday. Gretel came from Mike's farm years ago. Although we do not see the Wilde kids nurse, they do have milk in their bellies and are very active. 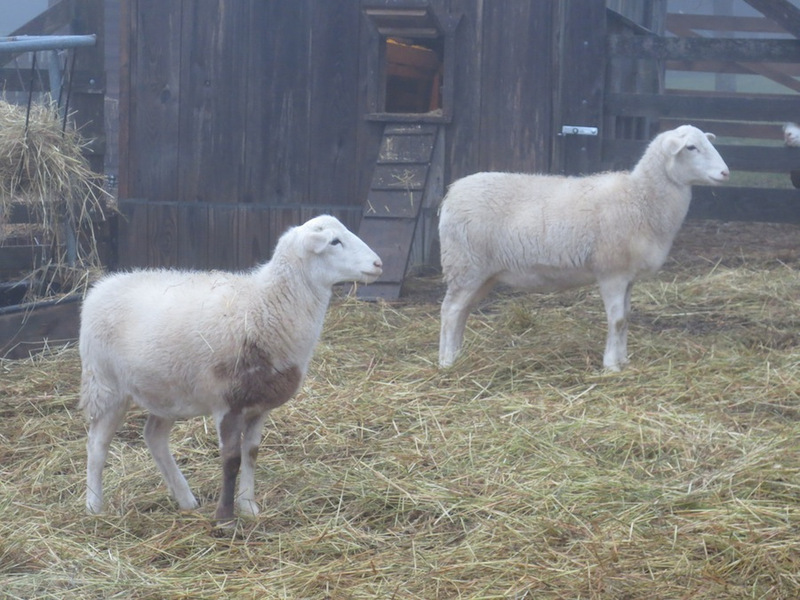 The Katahdin ewes have benefitted from a grain ration at the end of their pregnancies. At the end of January I noticed that the ewes, especialy the yearlings (also know as theaves or gimmers), were losing condition on a hay only diet.Because I needed to put the ram in with the ewes a month early last fall (Burgess' field companion died unexpectedly), the yearlings needed the added nutritional support as they continue to grow while pregnant. Daily, close contact, especially with delicious grain, has gentled the flock and even my shiest Katahdins tolerate closer handling. 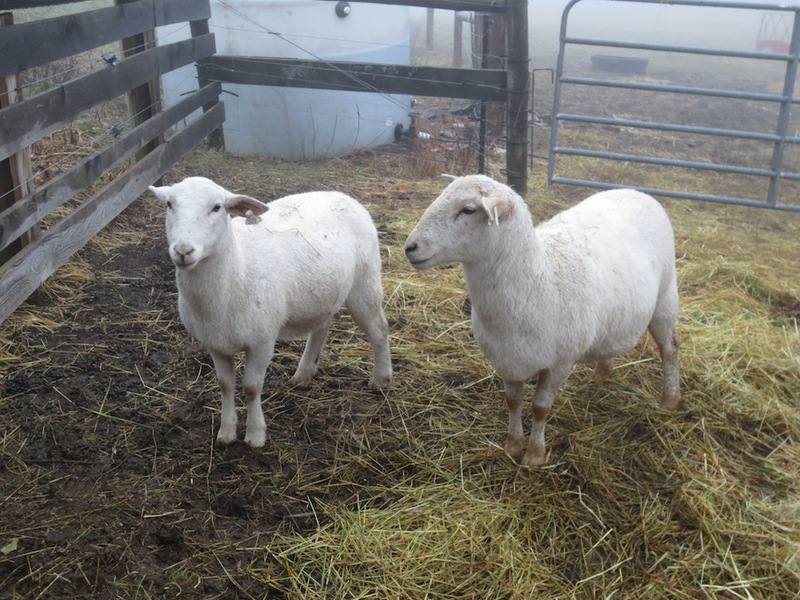 The older two ewes, Maude and Mab, are obviously getting ready to lamb. It is harder to judge the readiness of the theaves. The following post is not an effort to call out Murphy, not our donkey, and his fatalistic "Law" but to note my appreciation for a morning spent doing barnyard chores. On a windless morning with choretime temperatures in the midthirties, I was hatless as I feed and watered the livestock. The long black hose, that reaches all the way to the goose trough, unrolled easily without its usual frozen stiffness. With a few days of temperatures above freezing and nights not far below, the barnyard is neither an unforgiving, frozen tract nor a sucking, muddy mess making the transfer of waste hay stems to slick or muddy spots easy. While moving forkfuls of the fluffy waste I had time to watch the animals, especially the Belties and Murphy as they investigated my work and the vacated sheep pens. Today I released the wedding sheep from the goat yard. I want them to get more exercise and get accustomed to the ram because they will be penned together when the ewes go into the lambing barn. Murphy hopped into the empty goat stall through its small, barnside door and snuffled around in search of stray grain. Each of the Belties took turns watching longingly with ony room for a black curly head through the hatch. While the cattle and donkey nosed around the barnyard the wedding sheep blended easily to the flock clustered around the hay filled round bale feeder.Hopefully without the intereference of the often present Murphy's Law, I will be able to sort the wedding sheep during evening chores and get them back in their pen for their supplement of grain. Once colder nights arrived I stopped carrying forkfuls of hay twice daily and put a round bale into the feeder.The Belties have 24 hour access to the hay. At first, the Belties and Murphy the donkey were very territorial about the hay feeder, pushing and shoving for position. As the Katahdins trekked to the feeder Murphy would stand guard and a flick of his ear could dissuade the line of sheep from feeding.Now that there are mutiple circles of trampled hay waste dotting the field and the animals have accustomed themselves to eachother, the sheep eat their fill and head back to the barn for a rest.